In Rootwork, Veronica Golos’ third book of poetry, the author continues her restless exploration into American history, this time into the daily lives of anti-slavery abolitionists John Brown and Mary Day Brown. 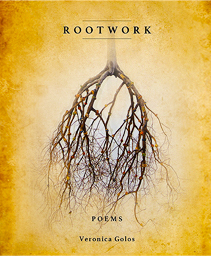 Combining sweeping scholarly research with epic re-imagining, Rootwork uses epistolary poems as a gateway into character, motivation, passion, and love. Golos digs deep into the Browns, and sets up an undercurrent as well, using the voices of runaways and ghosts. A book of great imagination and courage—she completely inhabits the lesser-known Mary Brown—Golos shows how poetry can seep beneath the skin with language both restrained and transcendent. Veronica Golos is a poet who has a deep passion for justice and truth-telling. Rootwork continues her exploration of language that brings us good and bad news of American history and culture. With her imagined lost writings of Mary Ann Day Brown and John Brown as the root of this important new volume, Golos asks of us to consider the emotional weight, spiritual depth, and intellectual heft of those connected with revolutionaries, rebels, the opponents of the social order. Brown’s hanging is often seen as the moment when abolitionists could truly say they would sacrifice themselves to end slavery, given that the plantation South had already decided they would do everything to keep the profitable industry going. While she digs deeper and deeper into the lives of those who made American history—John Brown, Sojourner Truth, Frances Harper, et al, it is Mary, the second wife and the mother of many children, whose interrogation of her own soul that Golos examines with language as spare as a Kansas landscape or as soaring as a sermon. With this collection, Golos reclaims an unheard voice among the many powerful voices for freedom. Veronica Golos is the author of two books, Vocabulary of Silence (Red Hen Press, 2011), winner of the 2011 New Mexico Book Award, poems from which are translated into Arabic by poet Nizar Sartawi, and A Bell Buried Deep (Storyline Press, 2004), co-winner of the 16th Annual Nicholas Roerich Poetry Prize, nominated for a Pushcart Prize by Edward Hirsch, and adapted for stage and performed at Claremont School of Theology, Claremont, CA. Golos has lectured at Columbia University’s Teacher’s College, Hunter College, Julliard School of Music, Regis University, University of New Mexico, and Colorado State University. She is Literary Consultant for agent Heather Mitchell at New York’s Gelfman Schneider Literary Agents, Inc. and co-editor of the Taos Journal of International Poetry & Art.